My first UFO finish of 2013! I'm delighted, and relieved. This quilt has been in the works for a while, and then sat for a bit longer. Thanks to Pat Sloan and her UFO tips, I got focused again this year on COMPLETING projects. I have started an official bucket list for quilts too - but that's a different story. My visual project list board has been a great incentive and motivator. I've already completed 2 projects listed, changed one, and now added a new one. Enjoying the feeling of an accomplishment this morning as I endure the endless snow days around here! The kids have been home since TUESDAY! 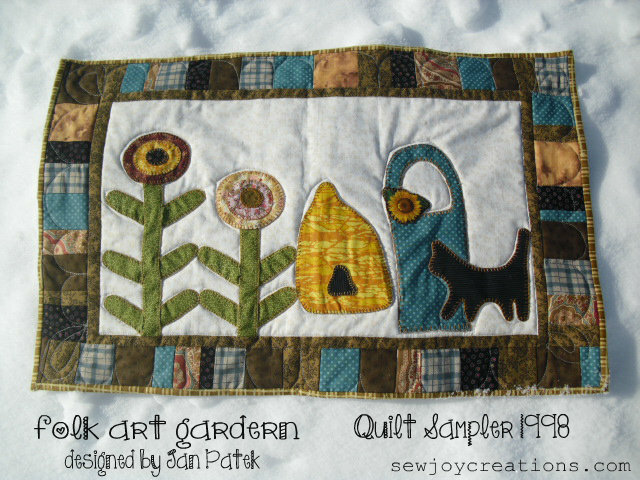 Funny thing is, I still managed to get this quilt done this week - and then some. It's a sweet little quilt! Who wouldn't love the kitty? :) Love your visual project board, too. this is very cute. it feels good to get something finished and see the wonderful end result.